Considering the array of talent involved and the fact the film was shot in the expensive two-tone Technicolor process, including the first-ever Technicolor animation, it's amazing that Universal entrusted this prestige project to debutant director John Murray Anderson, the only film he ever directed. 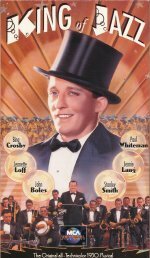 However, he produces a stylish revue, showcasing the talents of songwriters Jack Yellen and Milton Ager, bandleader Paul Whiteman and first-timer Bing Crosby as singer. However, the highlights are undoubtedly Gershwin's Rhapsody in Blue and the finale, The Melting Pot of Music. Yet for all this, it was a spectacular flop, as audiences tired of the early sound era's musical boom.